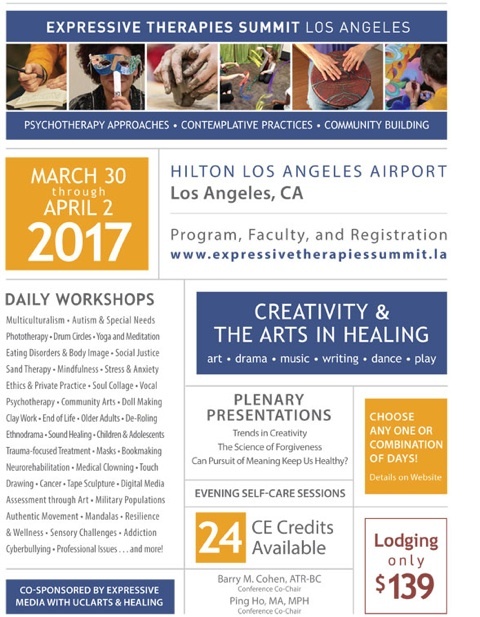 The UCLArts & Healing Conference in partnership with the Expressive Therapies Summit presents Creativity & The Arts in Healing to be offered this spring March 30 through April 2, 2017 in Los Angeles, California at the Hilton Los Angeles Airport. This 4 day conference is an opportunity to learn arts-based tools for facilitating communication, building connection, promoting positive emotions, fostering engagement, reducing stress, and managing the impact of trauma. Offerings include 125+ workshops delivered by leading national experts in art, dance, drama, drumming, music, and writing integrated with mental health practices. Select any one or combination of days. Over 30 continuing education credits are available. Creative expression invites self-reflection and dialogue that can lead to meaningful self-discovery, connection with others, and personal empowerment. Studies have shown that the arts—particularly when integrated with mental health practices—can yield social, emotional, physical and cognitive benefits. The nonverbal aspect of the arts transcends traditional barriers of age, ability, and culture. Shared creative experiences build empathy and community, which expand possibilities for action and transformation. 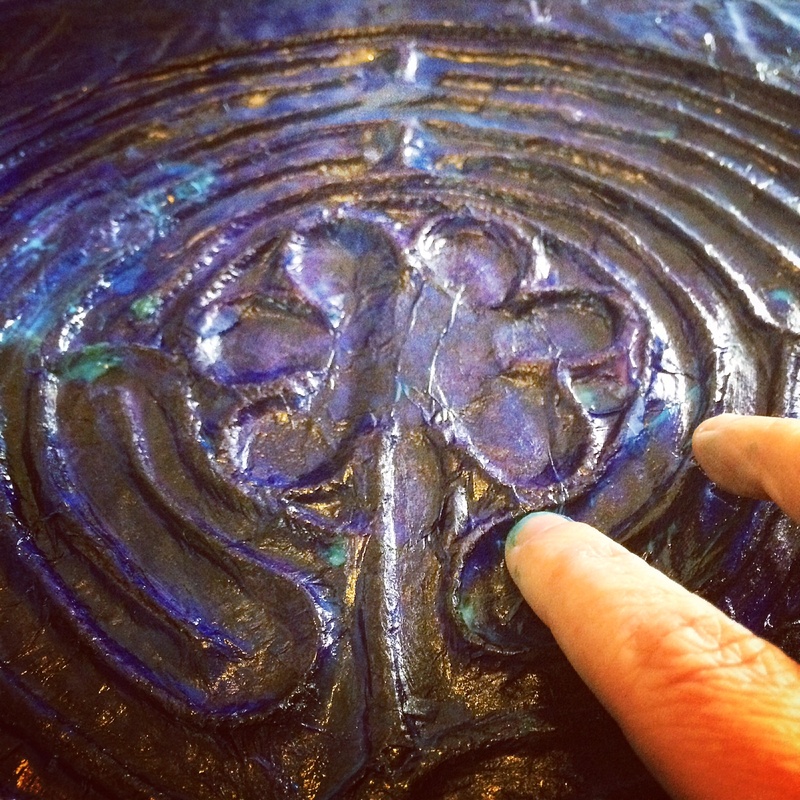 I am excited to be offering one of my favorite trauma informed and strength based workshops at this event: Tokens of Esteem and Affirmation, a mixed media art making session dedicated to making Artist Challenge Coins. In the military, a Challenge Coin is a medallion symbolizing achievement or esteem. They are also given out to enhance morale and membership for members of the community. 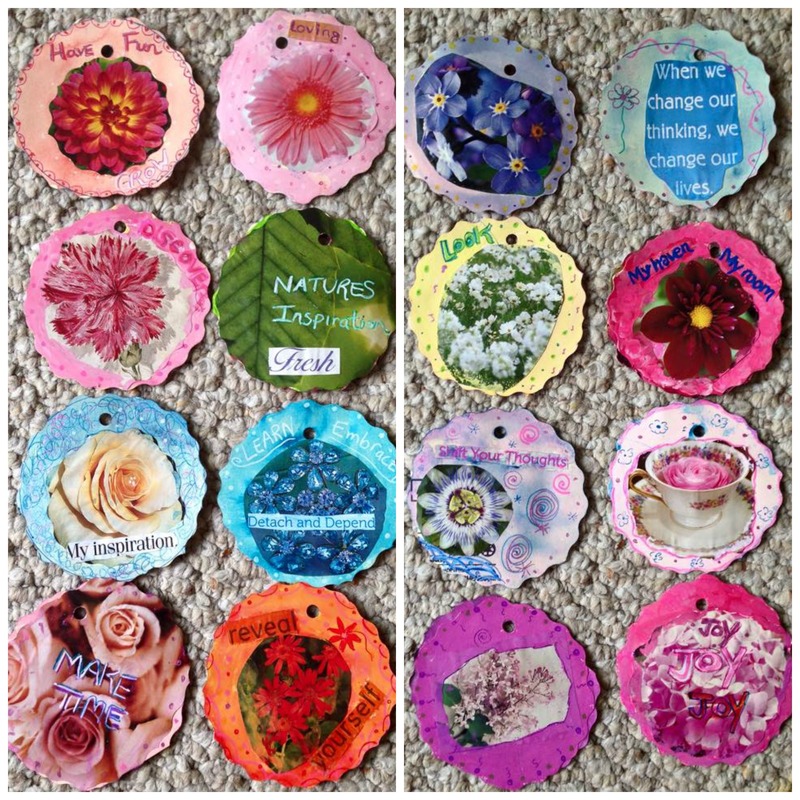 In the spirit of Challenge Coins, participants will learn how to make and use Artist Challenge Coins as tokens of affirmation, strength, and recovery. Participants will state 3 ways Artist Challenge Coins (ACCs) can be adapted to use with a variety of populations and therapeutic settings. Participants will describe a minimum of 1 value of using Challenge Coins with varied clinical populations. Not only will we be making a series of our own coins, but participants will also engage in a community art exchange with other workshop attendees. I would love to have you join us- this half day workshop is scheduled for Sunday, April 2, 10 am-1pm. To register and learn more about the Summit, its awesome line up of offerings and teaching faculty, check out www.expressivetherapiessummit.la. Early bird discounts are available through February 17! See you in LA! As part of this year’s Spectrum (on its opening day May 2! ), I am really excited and looking forward to chatting with Spectrum Organizer Hali Karla about the topic Creative Motivation: The Gifts of Online Community Participation. In our recorded video chat we’ll be exploring how to find your own rhythm and balance when using social media connections for inspiring & motivating your creativity. As you may know, it is a topic I am super passionate about! I can’t wait to talk with Hali about it and have it included to kick off Spectrum 2016 as a bonus offering for this year’s participants- Yay! How have you used social media connection to nurture or inspire your creativity? This month the Hildegard Center for the Arts published an inspiring, free resource of art-based ideas chock full of creative goodness called Art Bridges— Definitely a great collection (over 70 downloadable PDFs!) for art therapists to use with their groups or individuals, as well as teachers or anyone interested in creative enrichment with youth! 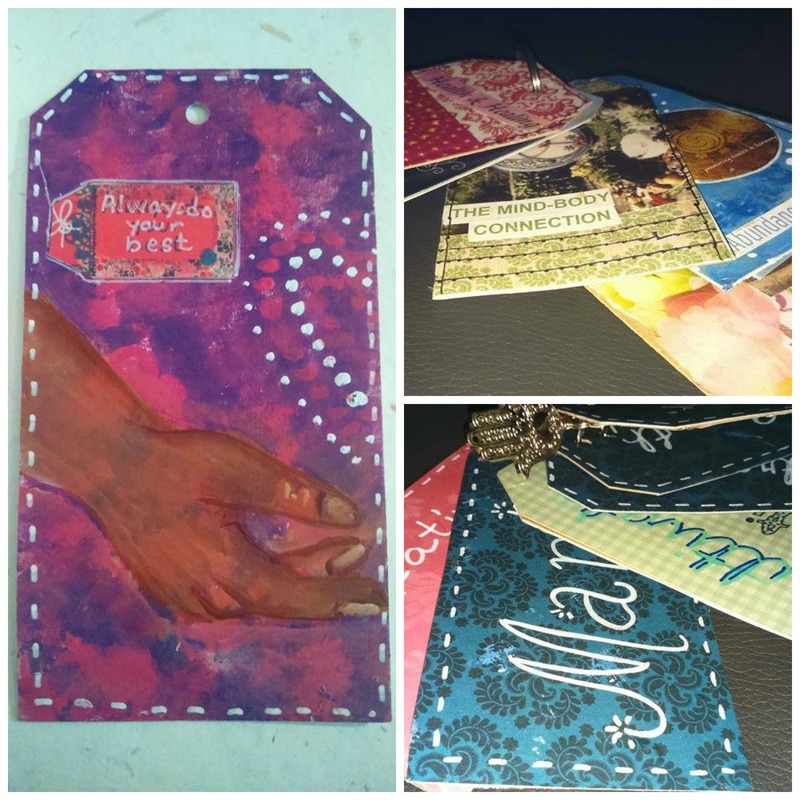 Some of the ideas were contributed by members of the art therapy community- including myself- I was delighted to be invited to add a favorite gratitude art idea that I featured on this blog in 2012. Since this post’s original publishing, I’ve used this idea with youth & women I’ve worked with in shelter- as a creative, affirming way to explore the concept of thankfulness in their own lives. Often instead of making leaf shaped “blessing tags”, we would make different size and colored hearts to write on and hang from the mason jar’s branches. It was a great community piece– the tree kept “growing” with new additions as more people add to it. Others can also read the reflections previously shared. The Art Bridges resource also suggests that therapists could also use the idea as a Courage or Healing Tree… a great idea that I may introduce into one of my groups! For me, shifting is about moving and changing and the shift in seasons that is upon us particularly reminds me of this. Fall tends to be an active time of year for my work, which also reminds me about the importance of my own self-care and finding creative solace amongst my busy surroundings. Just like the leaves that will be changing and falling soon, some things I have begin to let go of. Other things I hold onto with fierce dedication and determination. I think shifting includes the delicate art of balancing this concept of letting go vs. holding on and the possibilities this ultimately brings. Our art can serve as a safe place to explore these new directions, adjustments, and changing of the tide. September 19– 1st Annual Human Trafficking Prevention and Awareness Teen Summit hosted by the Renee Jones Empowerment Center in the Gordon Square Arts District in Cleveland. Learn more here! As part of this Summit, there will be an art center dedicated to creative expression to help teens attending share their hopes and empower their dreams. September 21– As part of the ADAMHS Board Annual Roads to Recovery Conference in Cleveland, Ohio, I’ll be offering the workshop, Art Journaling’s Visual Voice in Trauma Intervention. 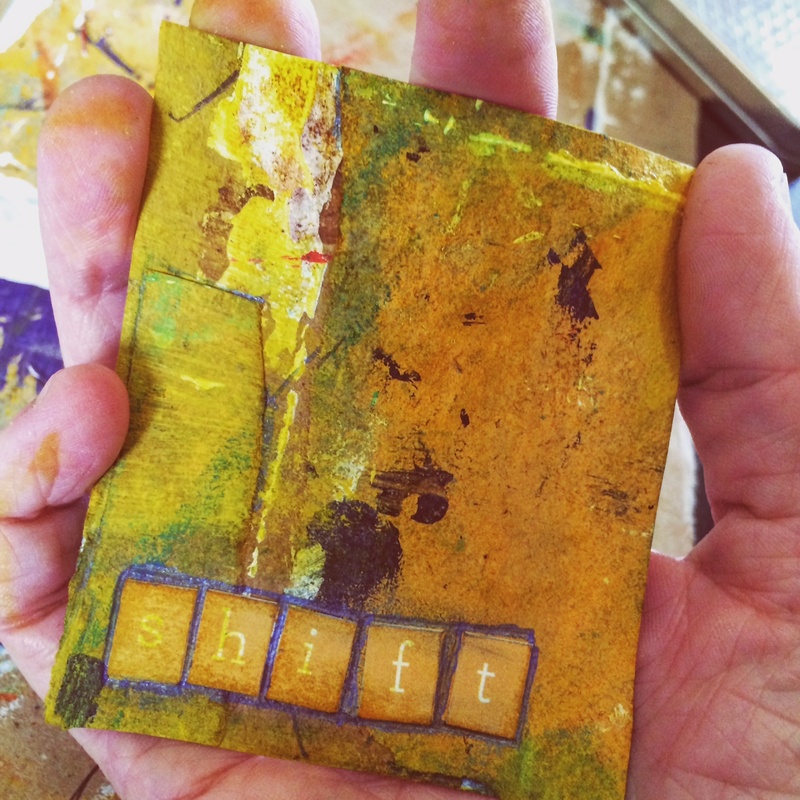 This hands-on workshop will explore the use of art journaling as a safe, contained space for processing emotional expression, promoting self care, and sharing ones personal narrative and intentions. Content will include themes and the benefits of art journaling as a visual voice and means of trauma intervention with survivors. 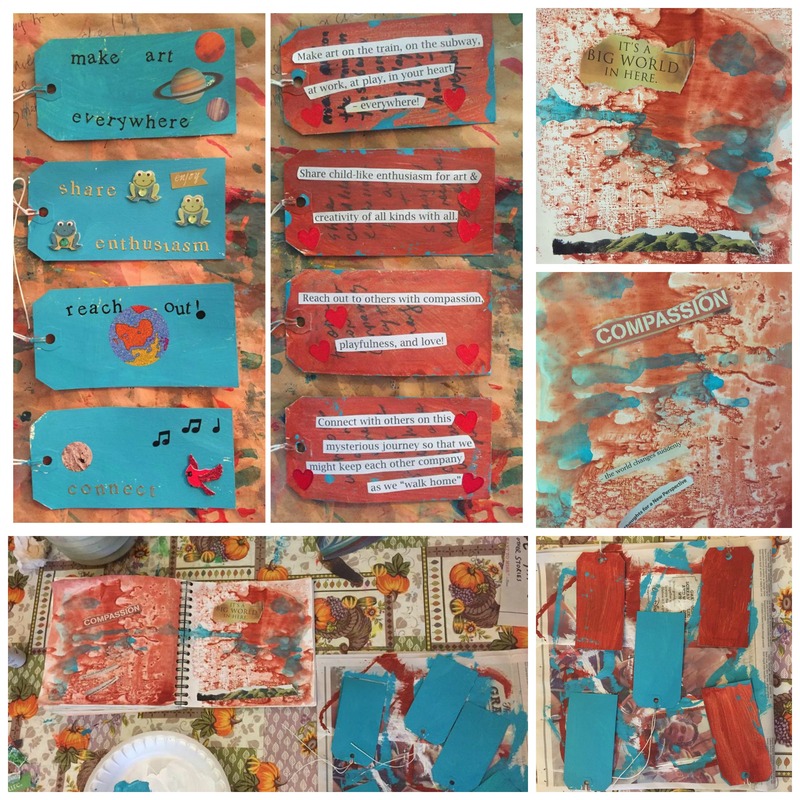 Participants will engage in creating their own mini art journal with mixed media to identify and support their own professional self-care practices and intentions related to working with trauma & loss issues. 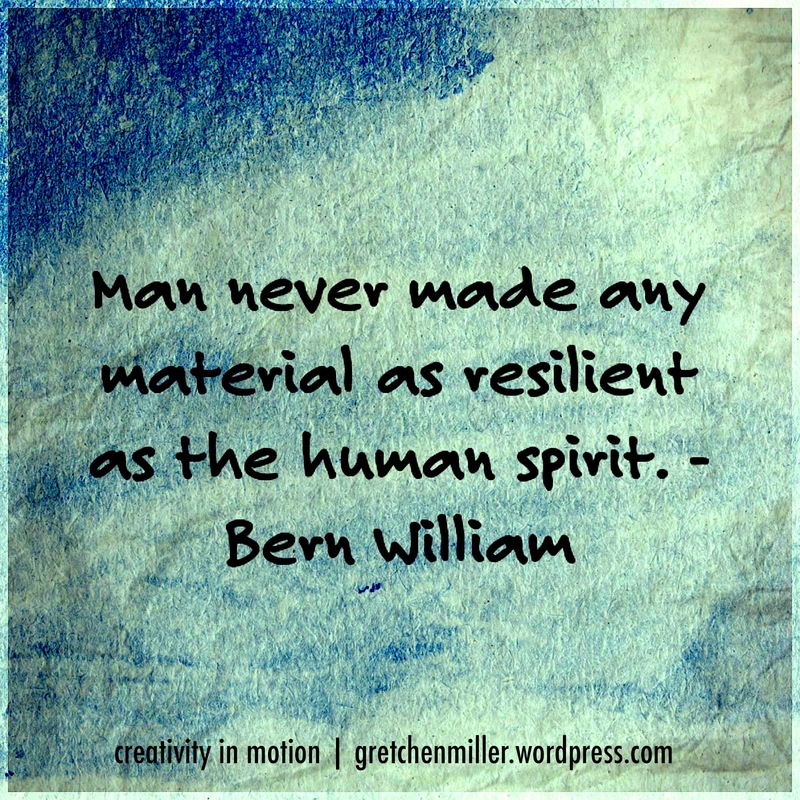 September 26– During the 2015 Buckeye Art Therapy Association Symposium in Columbus, Ohio I’ll be presenting the afternoon workshop, Strengthening Emotional Resilience through Art Journaling. This workshop of art-making and creative expression will focus on creating a simple, small, mobile art journal that can serve as a tangible reminder of emotional resilience, support and the importance of self-care for the work we do in service & care of others. Registration online is still open! October 3– As part of the New Jersey Art Therapy Association‘s Annual Meeting I’ll be offering the Keynote Address and an art making workshop focused on the conference’s theme: “The Art of Self Care for Professional and Therapeutic Resilience“. Registration is open here. October 23– I am honored to be included as a Speaker for the 2nd year of TEDx Ursuline College, being held at The Maltz Museum in Beachwood, Ohio. My talk will focus on the intersection of social media to foster creativity, connection, and community within the art therapy community and beyond! Learn how to purchase tickets here. Open through November (! )- Holistic Creative Circle- Spectrum 2015: There’s still time left to join in on this year’s Spectrum, hosted by Hali Karla Arts! This online offering is a multi-media experience guided by 25 artists, healers and visionaries. Spectrum is for anyone interested in enhancing intuition, strengthening courage, celebrating wholeness & diversity, widening perspective, developing deeper relationships, and who wants to offer her own gifts to the world, guided by personal awareness and creative living. I am so excited and grateful to be part of this year’s Spectrum Teaching Collective to offer a new workshop, Creative Covenants. ​ Learn more about Spectrum and all its offerings here. Group Strategies & Interventions with Traumatized Children and Adolescents eCourse: Looking for CEUs? My continuing education course offered through The National Institute for Trauma and Loss in Children focuses on the benefit, strategies, interventions, and considerations important to facilitating group work with traumatized children and adolescents. Course content introduces participants to themes, sensory based activities,therapeutic books, games, and creative interventions to implement in the group setting with traumatized youth. 6 CEUs available. Registration is on-going and the course is self-guided, so you can complete it at your own pace over several months. For more information and to register, visit this link. 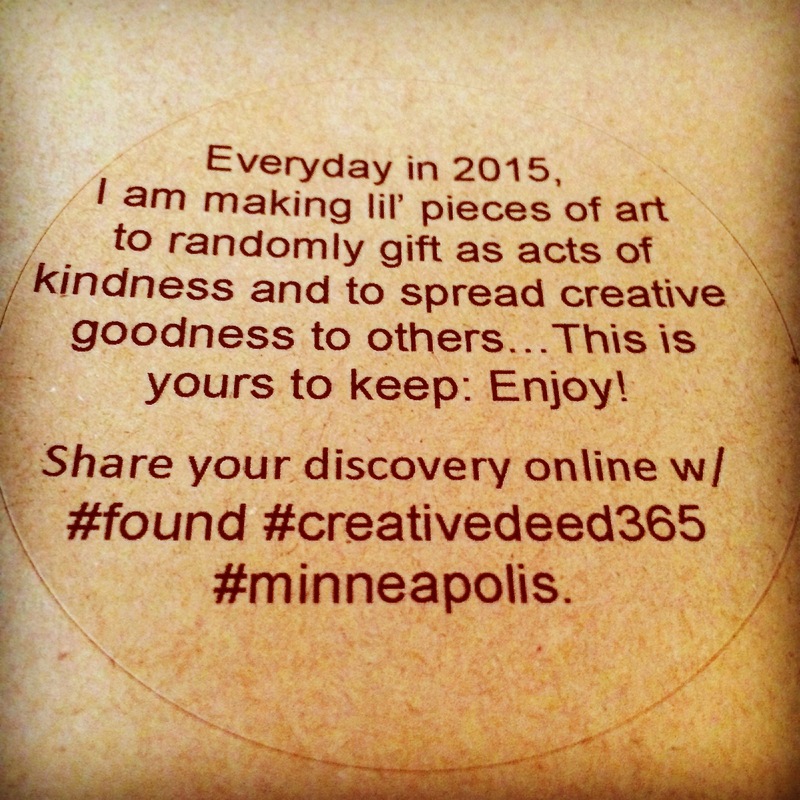 Earlier this month, Creative Deed 365 Minneapolis took place during this year’s AATA Conference in Minneapolis, which was a delight to follow via participants who shared this activity on social media. There were some inspiring discoveries left and found during these 5 days! Thank you to everyone who participated, both deeders and finders- so much fun! Below are all of July’s offerings that I made and distributed throughout the month…. I am still making progress with my Creative Deed 365 mailing list, where I am sending out creative deeds through the postal system too- some of July’s offerings went out today! 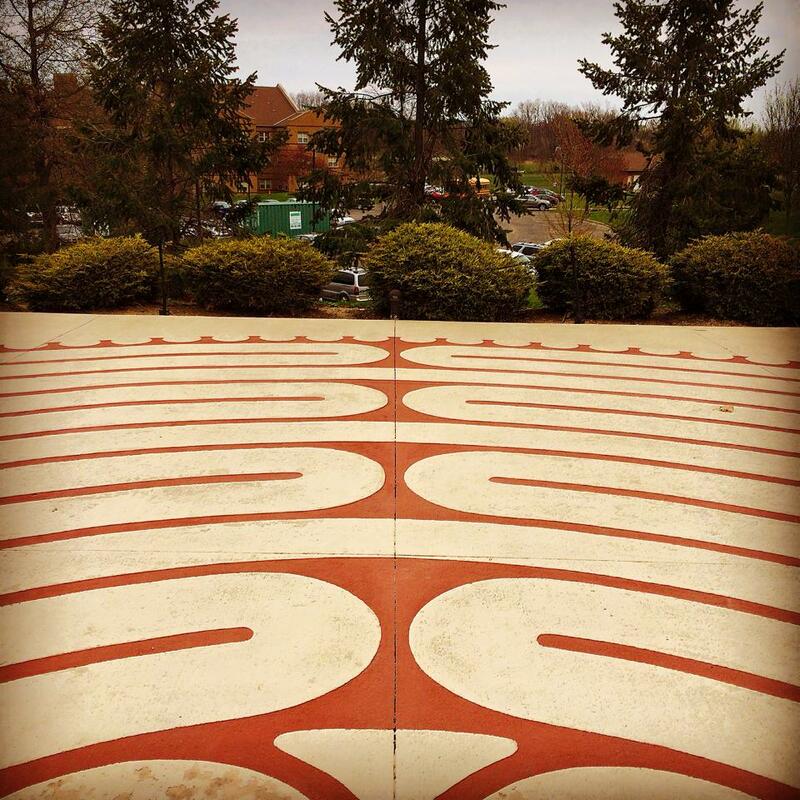 Instagram continues to be a popular place to share: over 700 creative deed related photos have been posted so far-! 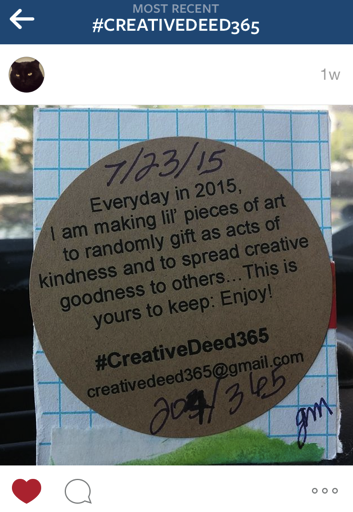 Check them all out here with the #creativedeed365 hashtag. Wow….definitely past the half way point now— August creative deeding awaits! 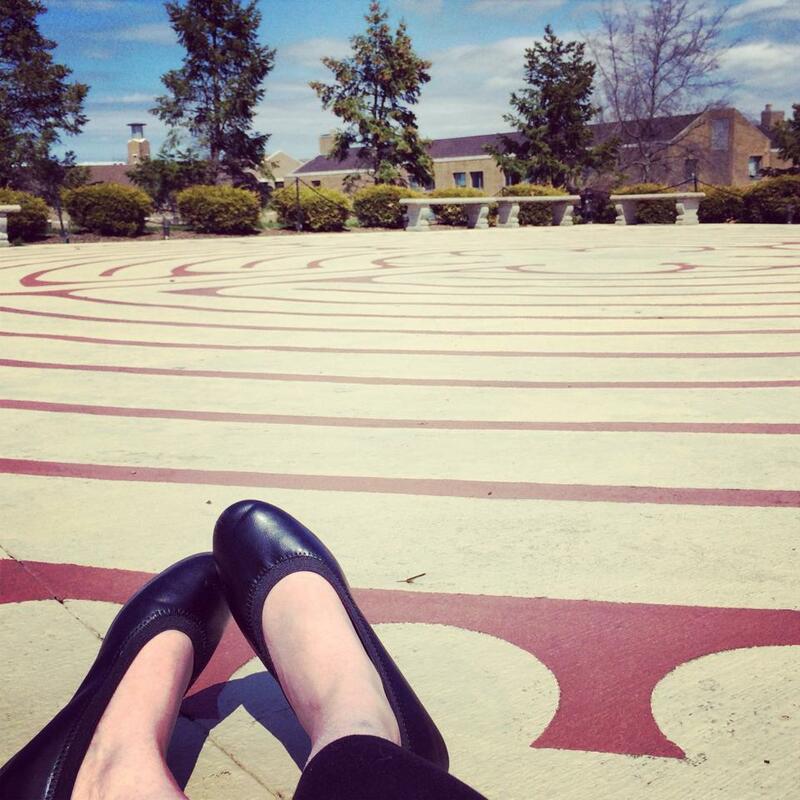 One of my favorite places on the campus of Ursuline College is its beautiful outdoor Labyrinth. For me, this is a peaceful and calming refuge that I often use as a walking meditation and a way to slow down and pause- spring, summer, fall, and winter. 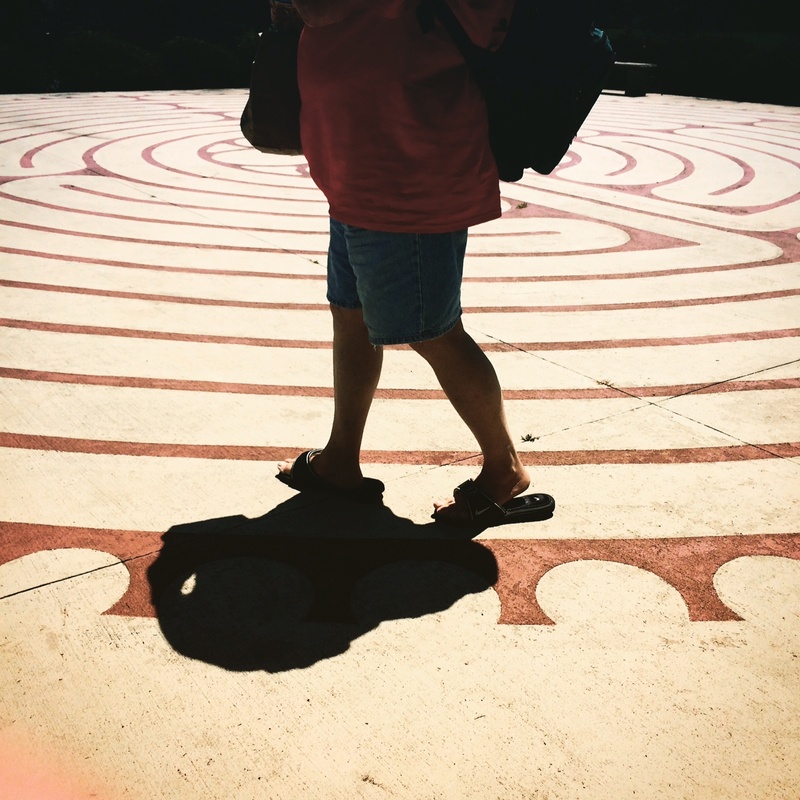 I recently was able to introduce one of my art therapy groups with Ursuline’s ArtSpace Outreach Program to the power of the labyrinth through a visit to the site, as well as engage group members in creating their own finger labyrinths to use as a portable and accessible meditative tool to manage stress, anxiety, and promote awareness. 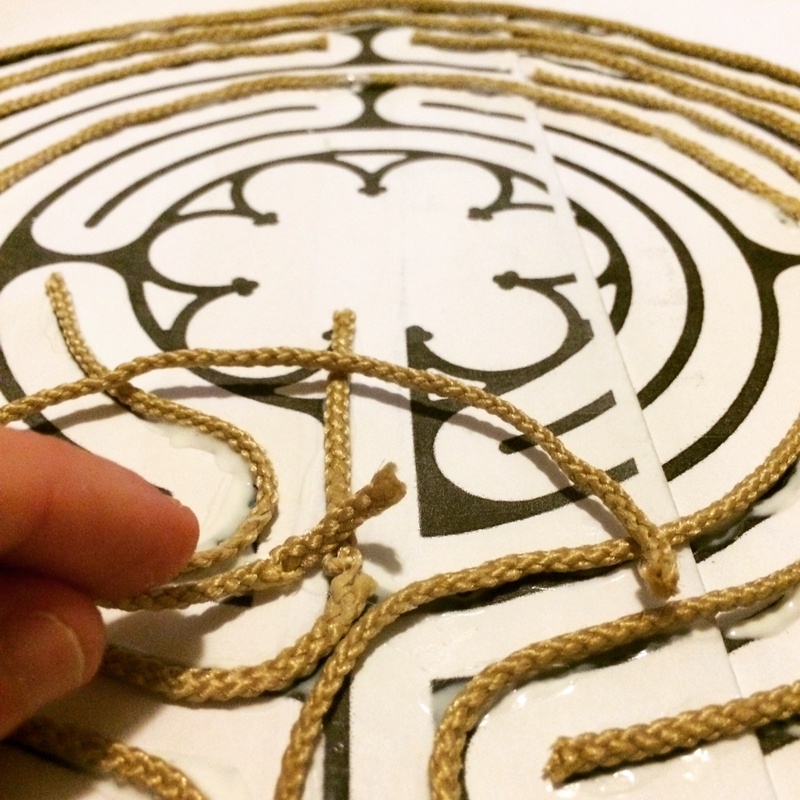 I discovered this fabulous finger labyrinth how-to from Heather Plett that was perfect timing for this labyrinth fieldtrip. 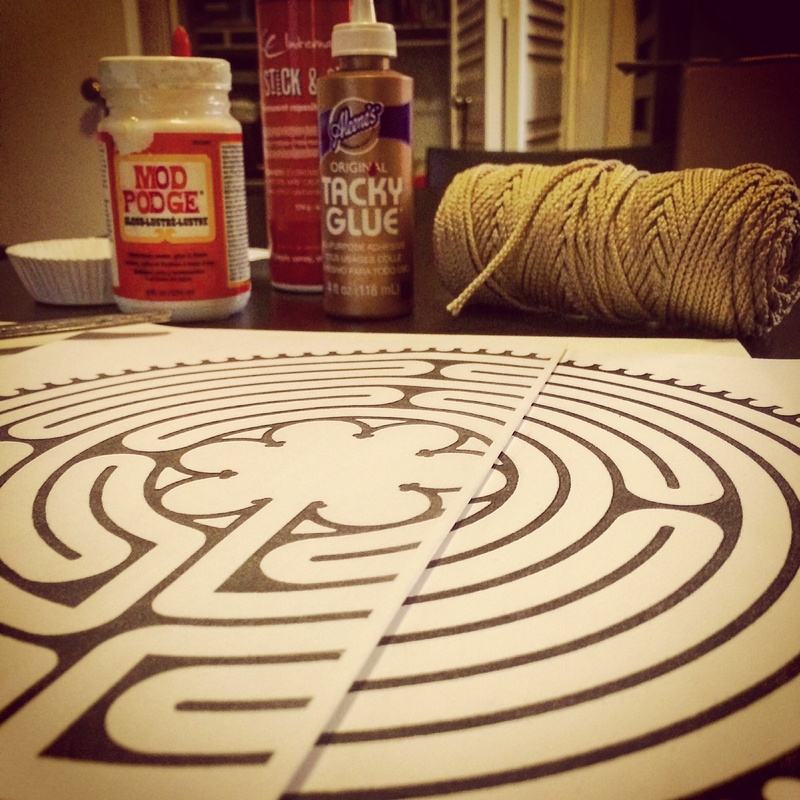 I chose to use bleeding tissue paper with mod podge to cover the craft cord I glued down over the labyrinth pattern. 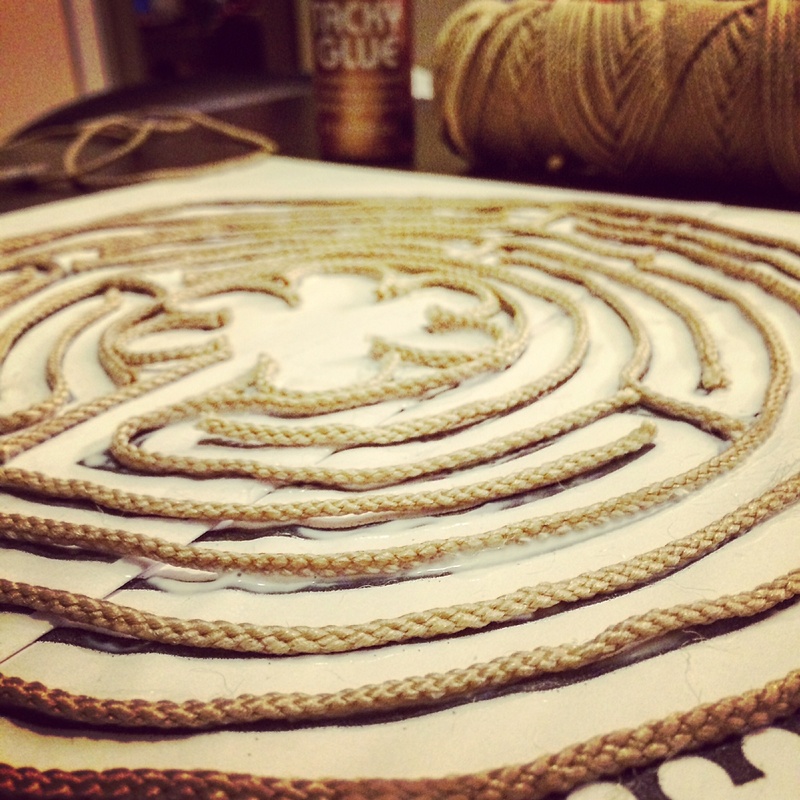 When all the craft cord was covered and dried, I took a silver ink stamp pad to brush/press over top to accent the pathway against the background. Lots of fun to create! Earlier last month, Hali Karla Arts’ holistic online creative circle Spectrum opened to much excitement and anticipation! I’ve so enjoyed seeing all the creativity, inspiration, and encouragement being shared within this community. 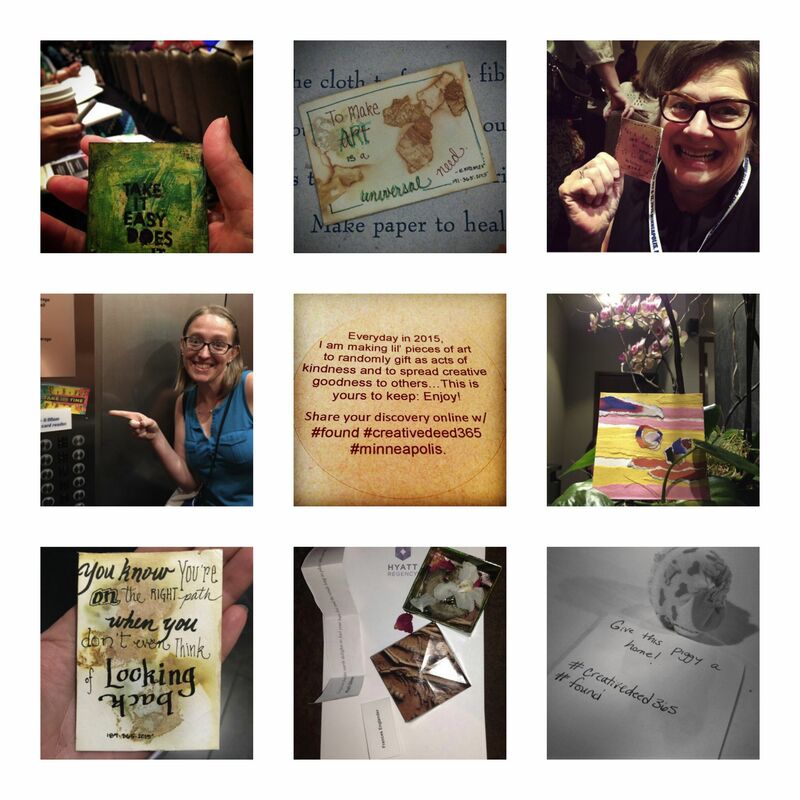 In this post I want to share a peek into some of the Creative Covenants that have been made by Spectrum participants (and who kindly gave me permission (thank you!) to share their art with you!). Each time a new collection of Creative Covenants graces the Spectrum community space, it’s exciting to take in what has been created- in form, colors, symbol, intention, and the promises being made to ones creative self. 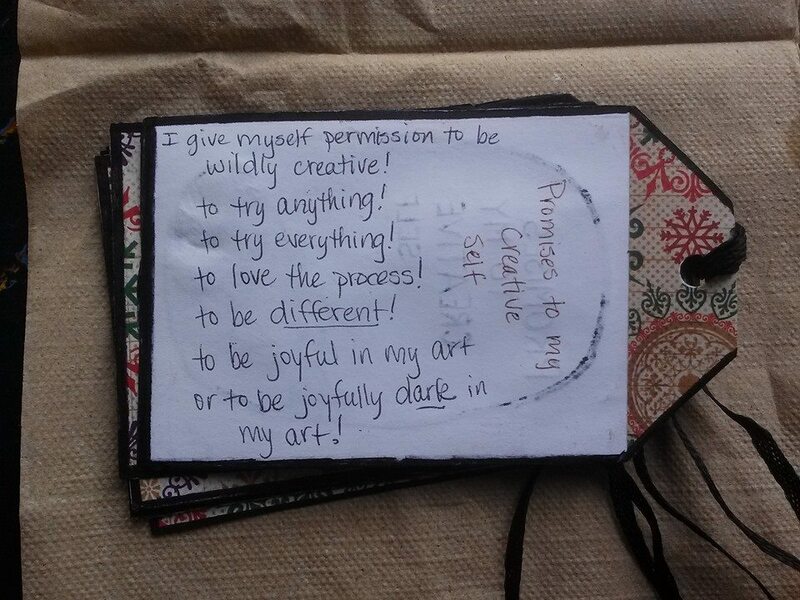 Laurie included her heart shaped Creative Covenants in her art journal! Carol has been working on a series of different Creative Covenants on cards and tags that honor her permissions and celebrations! 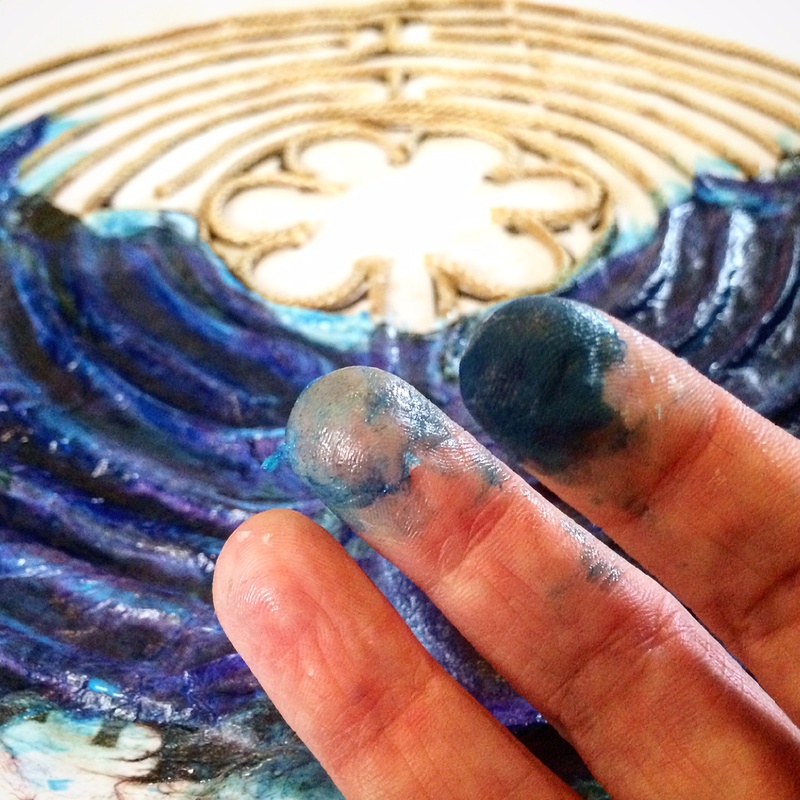 Fun to see Eleni’s Creative Covenant process from start to finish! 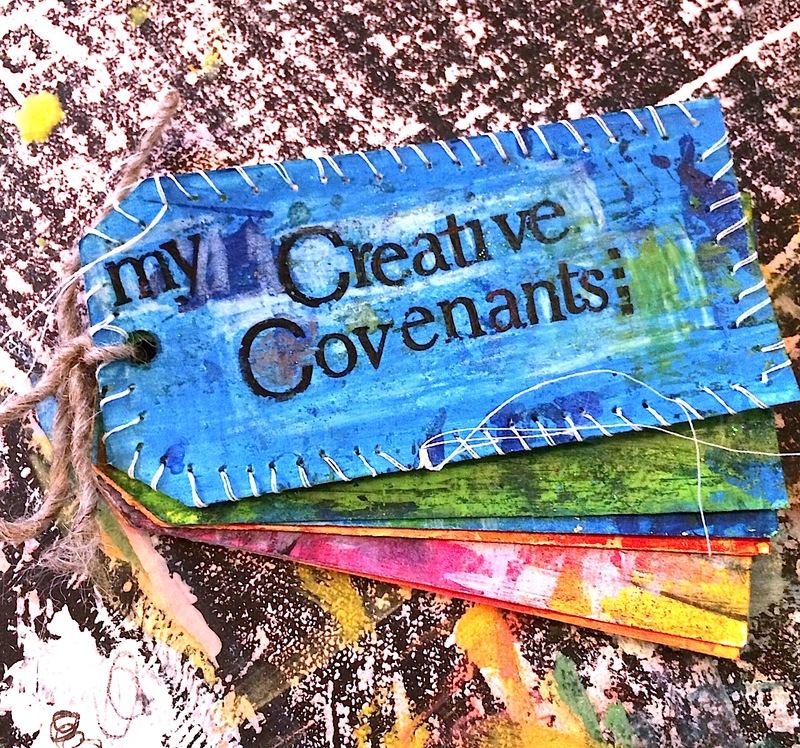 A beautiful collection of Creative Covenants created by Britt-Marie! Witnessing these Creative Covenants and many others come to life through art expression is a sacred reminder of the power of intention & its important value in our creative life. What a courageous, soulful adventure this has already been… Thank you Hali for bringing everyone together through Spectrum’s art filled invitations! Registration open until Nov. 1 – Join in anytime!